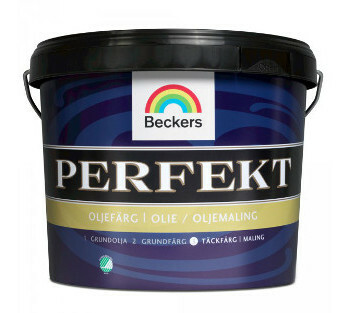 Beckers Perfekt Oljefärg 1L – an exterior alkyd paint reinforced with acrylate. Use it for painting wood fences, windows, doors and the like. Paint also onto primed metal surfaces. 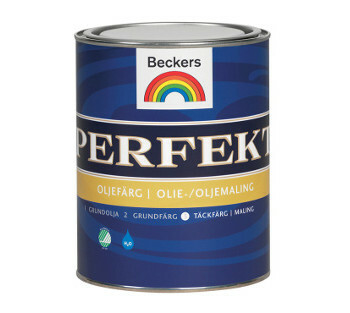 Beckers Perfekt Oljefärg is easy-to-clean, durable, waterproof and has a slight sheen. On new wood, prime with Perfekt Grundolja (base oil) and Perfekt Trägrund (wood primer). This will give you the best possible result. paint if risk of rain the next day or of dew within about 1-2 hours from painting. NOTE: Liquid residues and washing liquid constitute hazardous waste and must not be poured into the sewer. Consult local by laws for disposal.